APPLY (Part 3): After hair is in "touch up" sections, starting in the back right section, pull down 1" of hair and begin applying product just off the scalp through the ends of hair. Use a fine tooth tail comb to comb product into each section. PRO TIP: Make sure that there is complete coverage. Proper saturation is key, all of the hair must have product applied to it to perform correctly. Formaldehyde Free Keratin Treatment: This keratin formula is both formaldehyde free and releases no harmful gases. Use this treatment to reduce curl and eliminate frizz for up to 90 days. Total Repair Sulphate Free, Color Safe, Keratin Safe Shampoo: This shampoo is to be used for every shampoo after you have done your treatment. This formula is designed to specifically go with the treatment. Sulphate free and color safe. 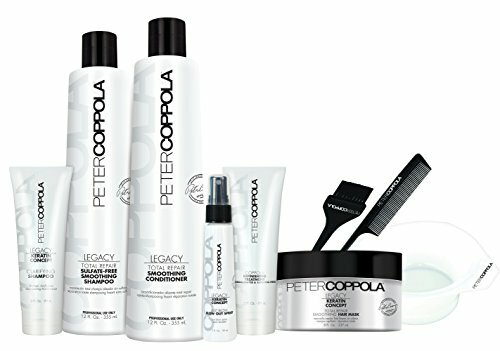 Total Repair Keratin Conditioner For Aftercare: This repairative formulation nourishes and rebuilds keratin bonds to maximize the life of your treatment. Thermal Protectant Just Blow For Blowouts: This spray on leave in conditioner protects hair during blow dries and reduces the damage of flat ironing. This rebuilding formula helps the longevity of your keratin treatment and reduces blow dry time.